Well it seems that some major corporations are beginning to latch onto the idea of Creative Commons content. They also have a wiki, and one can actually participate in the project to change the direction of the storyline. Expect to see more intelligent corporations engaging in this sort of marketing in the near future. 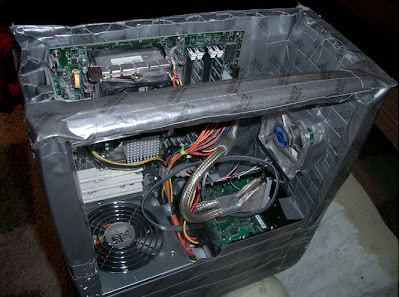 More proof that a roll of duct tape is always a good idea to carry around. These guys dreated their entire server case from it, and chronicled the process with photos as well as a short YouTube video. What follows is a critical consideration of Combat, the cartridge originally included with the Atari Video Computer System. Atari introduced the VCS in late 1977. The system retailed in the United States for about US$200, the equivalent of about US$650 today. The console, model number CX2600 , came with two joystick controllers, two paddle controllers, a TV/ game switch box and a cartridge bearing product number CX2601 . The cartridge was Combat, a “game program” with 27 games, which were according to the included manual: variants of tank, tank-pong, invisible tank, invisible tank-pong, bi-plane and jet (Atari 1977). In the tank games, the two players move their joysticks left or right to turn their iconic tanks. Moving the joystick up causes the tank to go forward, while pressing the button fires a missile. Obstacles appear in some of the tank playfields and there are other variations in play. The two plane games are similar, but there are no obstacles in any of them -” only blocky, obscuring clouds in some versions -” and the planes always move forward. They are steered by moving the joystick up or down and go faster or slower if the joystick is moved right or left. The player whose tank or plane is hit the fewest times during a game, which lasts two minutes and 16 seconds, is the winner. Gold Farming in China. NY Times Article. It was an hour before midnight, three hours into the night shift with nine more to go. 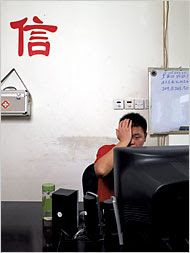 At his workstation in a small, fluorescent-lighted office space in Nanjing, China, Li Qiwen sat shirtless and chain-smoking, gazing purposefully at the online computer game in front of him. The screen showed a lightly wooded mountain terrain, studded with castle ruins and grazing deer, in which warrior monks milled about. Li, or rather his staff-wielding wizard character, had been slaying the enemy monks since 8 p.m., mouse-clicking on one corpse after another, each time gathering a few dozen virtual coins — and maybe a magic weapon or two — into an increasingly laden backpack. Julian Dibbell has written a book entitled Play Money which explores the implications of Chinese Gold Farming in World of Warcraft. A short story called Anda’s Game which also involves Chinese gold farmers can also be found in Cory Doctrow’s new collection of shortstories Overclocked . 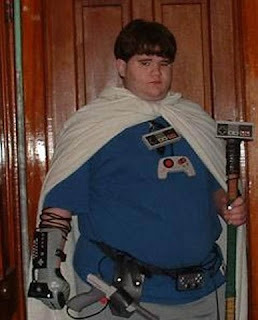 I’m guessing this guy pwns at Dunk Hunt. Andrew Keen is an opportunistic pig. Here’s his latest diatribe against the current state of the internet. From NPR. I also just bought http:www.andrew-keen.com heehee:) any ideas what I should do with it?? Leave me a comment with your ideas. 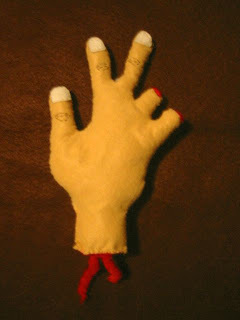 She made this hand with the severed for my friend who we forced to see Hostel. He wasn’t very impressed with the film, so she had to immortalise it in some way. 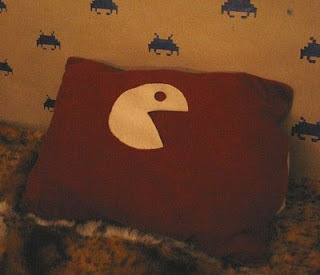 She made me this pacman pillow for an installation I did last year. I’m posting this because I want my female readers to know that they can send in their stuff as well. There is a lot of boyliness going on here at nerdarts and I like to see both sides. 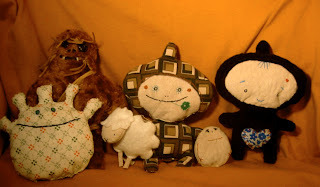 I really like a lot of the stuff going on at etsy.com . So girls, feel free to send us your submissions as well! Rey Ortega’s super cool interactive adventure! Rey Ortega has made a great interactive book. Reminiscent of the Choose your own adventure series. 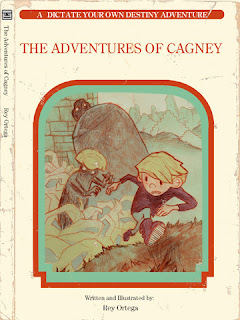 You are Cagney who is transversing though a fantastical landscape, encountering monsters, and making tough decisions. The illustrations are great, and the weathered look that he gives the book make it all the more personal. I won’t give anything away, you have to play/read it for yourself! Every NES Game Ever Made!